Blowout Sale! Free Shipping Included! Save 51% on the Mimitakara (Dual) [Black] FDA Registered Rechargeable Sound Amplifier, with Bluetooth technology by Mimitakara at SFCPA. MPN: DP6KAB1C3. Hurry! Limited time offer. Offer valid only while supplies last. ✅ RECHARGEABLE FUNCTION: Mimitakara Japan® includes built-in rechargeable battery that is encased in the device. The average recharge time to fully recharge the hearing amplifier is ± 2 hours. There will be an indicator light to indicate that the device is charging. Up to 11 hours of continuous use per charge. ✅ APPROVAL CERTIFICATES: FDA registered, RoHS approved, ISO 13485 Certified and CE 0434 Compliant. Independent volume control for both ears. 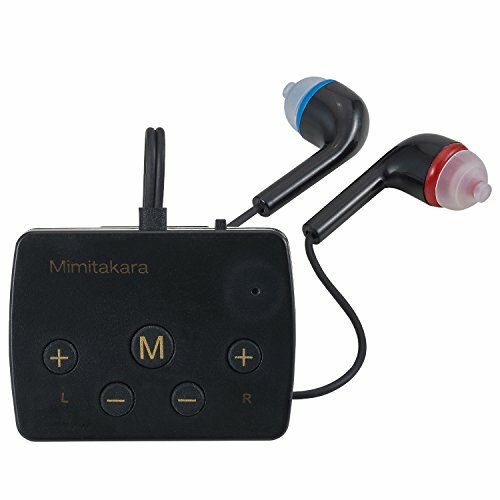 ✅ ACCESSORIES & FEATURES: Mimitakara Japan® DP-6KA comes with 1 x Main unit with built-in ear buds, 1 x Cleaning brush, 1 x USB power brick, 1 x USB cable, 3 x Additional pairs of (Large, Medium & Small) size ear buds, 1 x Detailed instruction manual. Features comes with independently controlled Volume up and down controller for each ear, Mode button, built in microphone, LED Indicators, Power switch, Reset switch, Charging port, Clip on design, 5 different Color covers and built in earphones. ✅ BLUETOOTH FUNCTION: Mimitakara Japan® DP-6KA has a built-in Bluetooth chip that has a 2 way function. It can be paired with mobile devices. Play back the audio media from the connected device such as music and video. You will be able to make and received phone calls and talk naturally without holding the phone to the device. This allows you to received and make phone calls at the same hearing level too without needing to adjust the volume to your hearing needs. If you have any questions about this product by Mimitakara, contact us by completing and submitting the form below. If you are looking for a specif part number, please include it with your message.